Tiferes Judaica Store is the new online shop of Tiferes Stam. 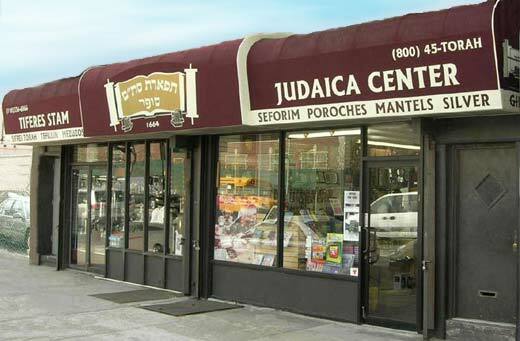 A well established Judaica Store in the heart of Brooklyn, New York. We specializes in Safrus, all of our Safrus products are guaranteed Kosher and come with a certificate of authenticity. Our Tefillin, Mezuzahs and Torah Scrolls are written by ordained scribes in Israel. As a result of our well established reputation Tiferes Judaica is able to get the best prices on the highest quality Sifrei Torah, Tefillin and Mezuzahs. Most of our Judaica Silver is produced in Israel. Our collection is unique and features only the best Judaica Silver available. Tiferes Judaicia also has connections with Shomer Shabbos silver smiths in Israel who are capable of producing custom heirloom pieces for your family or one of a kind crowns for your synagogue. We have had the privilege of assisting many synagogues and schools with the coordination of successful Torah Writing campaigns, Tefillin - Mezuzah Inspection Campaigns, Educational Workshop Seminars and Mitzvah Fairs. Hundreds of thousands of dollars have been raised utilizing our innovative fund raising approaches. Call us for a free consultation in organizing a program that works best for you. Our Sifrei Torah, Tefillin, Mezuzos and Megillos are acclaimed by the most prestigious individuals and religious institutions throughout the world. Our staff of certified Sofrim are renowned for their craftsmanship and expertise in writing, inspecting and restoring the sacred scrolls.